This watch with round 41mm case in white ceramic. Bezel also in ceramic with two rows of dazzling round-cut diamonds and 6 silvered screws. White dial with chronograph subdials at 9 and 6 o'clock and a red central seconds hand; small seconds subdial at 3 o'clock; date display at 4 o'clock. 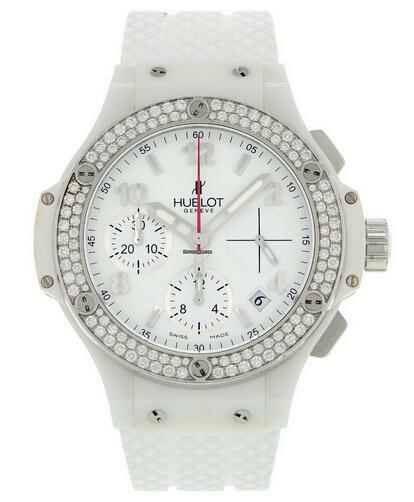 White rubber strap with push-button folding clasp. HUB 4300 Self-Winding chronograph movement with 42 hours power reserve.